wild shores of singapore: How can we stop grasscutters from littering nylon strings? How can we stop grasscutters from littering nylon strings? The issue of grasscutter nylon string litter is in the Straits Times, thanks to Jose Hong. A letter on this has been sent to NParks and the Municipal Services Office. In it, I highlight that we don't want to just complain, but want to help to stop this permanently. 18 Sep 2018 by Ria Tan. 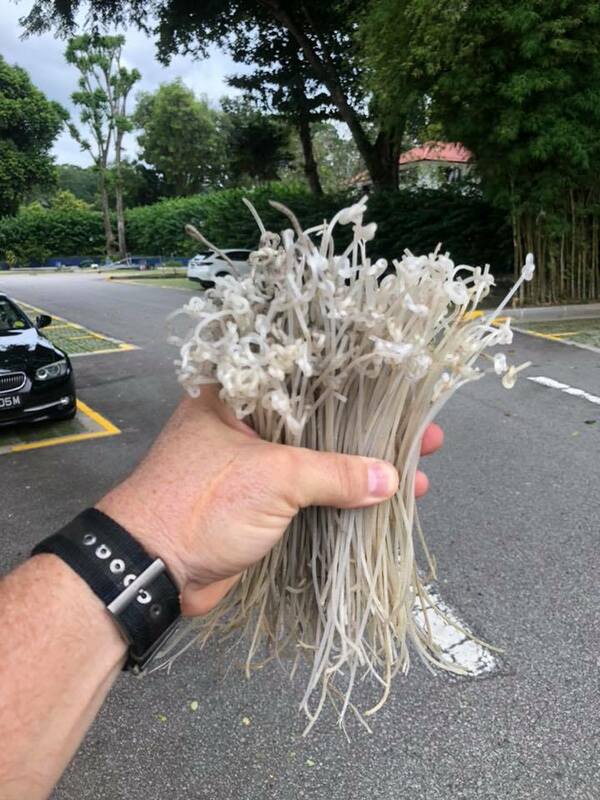 Special thanks to all the people who tirelessly picked up, photographed and shared their sightings of these heartbreaking litter all over Singapore. Please keep sending me your sightings. This is the letter I sent to agencies. Also online here. 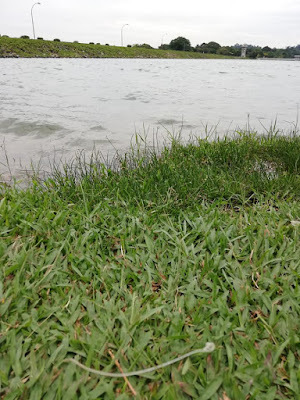 2,900 nylon strings littered by grass cutting contractors have been sighted by a small group of the public, over three months (Aug-Oct 2018). These sightings have been mapped over many areas in Singapore, and photos collated in an album. I am deeply concerned about the potential for these strings to become a long term source of microplastic pollution if these are allowed to continue to build up. 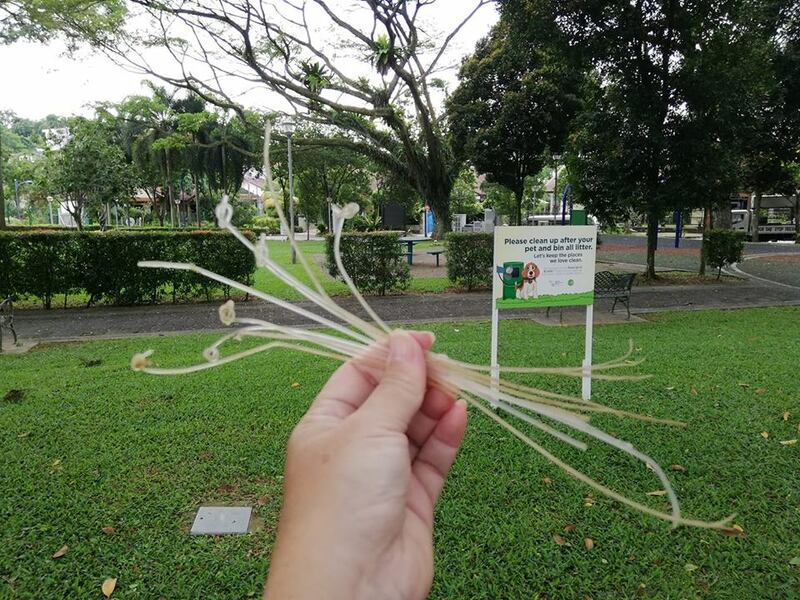 Given the vast expanse of grass in Singapore, if there is no systematic, permanent stop to littering of these strings, their pollution potential will only grow over time. Sightings of zero strings were also recorded, showing it is possible to maintain vast areas of grass without littering strings. 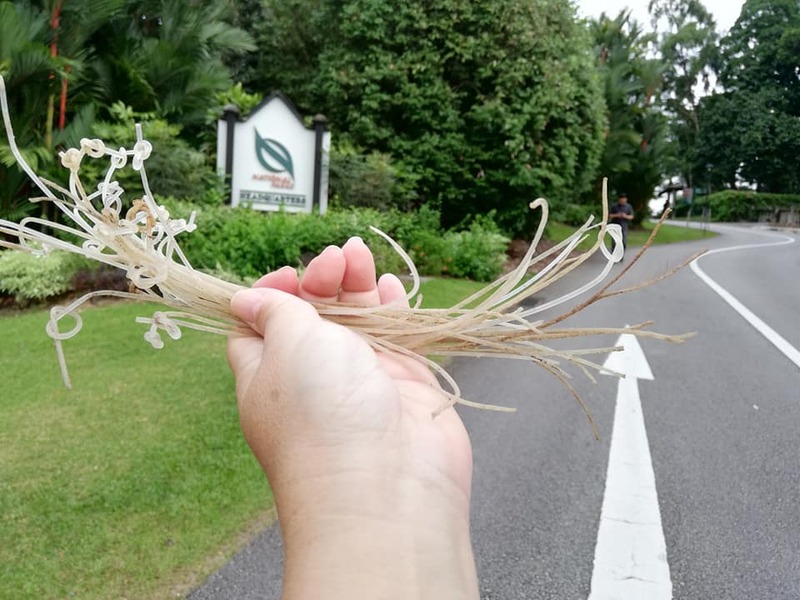 Zero strings were found at Pasir Ris, Changi Point, West Coast and Windsor Nature Park. More details about the sightings are below. Arising from this, I have a few questions and suggestions. 1. Is there a clause in the contract for grass cutting that penalises littering of these nylon strings? 2. If there is a clause, what are the details of penalties applied for littering of these nylon strings? What is the penalty for littering these nylon strings. Number of times penalties have been applied in a year, say in 2017. Total dollar quantum of penalties imposed in that same period. Areas affected by these penalties. 3. How can the public more effectively help so as to better ensure grasscutters do not litter these strings? Individuals had in the past reported these sightings without any noticeable improvement. I personally reported strings at a small park in my neighbourhood, but after removing all strings, I continued to pick up strings after each round of new grasscutting. I am happy to meet with agencies to discuss how the community can work with government to help find a permanent solution to this issue. Meanwhile, a few of us will continue this call to action for the public to help remove and report the strings that they find. I will continue to map and collate their findings too. 30 strings at NParks HQ on 17 Sep 2018 by Ria Tan. Why are these strings an environmental issue? 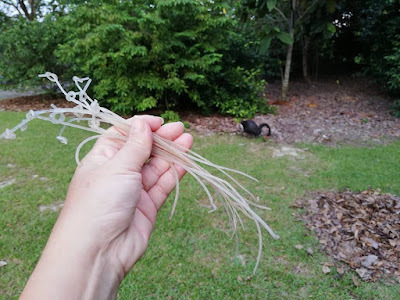 These single-use plastic strings are a source of environmental pollution. They are made of nylon which do NOT biodegrade into harmless substances. Instead, over time, they break down into tinier and tinier particles of plastic (microplastics). When the strings wash into our waterways, they add to debris and microplastics. These microplastics can end up in the water we drink. 18 Oct 2018 by Ria Tan. Studies have shown that microplastics can enter the food chain, harming wildlife and people who eat wild-caught fish and other marine life, as well as aquacultured fish and seafood. Given the vast expanse of grass in Singapore, if there is no systematic, permanent stop to littering of these strings, their pollution potential will only grow over time. 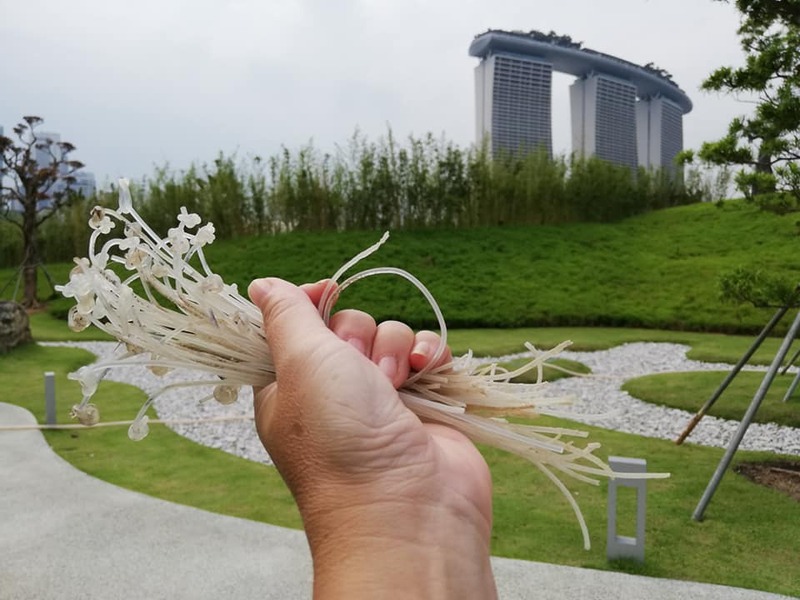 During Aug-Oct 2018, 42 people shared sightings of 2,904 strings, spread almost everywhere in Singapore. Sightings of zero strings were also recorded, showing that it is possible to maintain vast areas of grass without littering strings. Zero strings were found at Pasir Ris, Changi Point, West Coast and Windsor Nature Park. Singapore Botanic Gardens (66 strings) with 15 strings at Eco-Lake at areas where black swans foraged. 20 Sep 2018 by Ria Tan. on 4 Nov 2018 by Ria Tan. Strings were commonly abundant on narrow streetside grass verges and central road dividers. Strings were generally absent from large flat grass meadows. Because these are probably mowed by garden tractors. 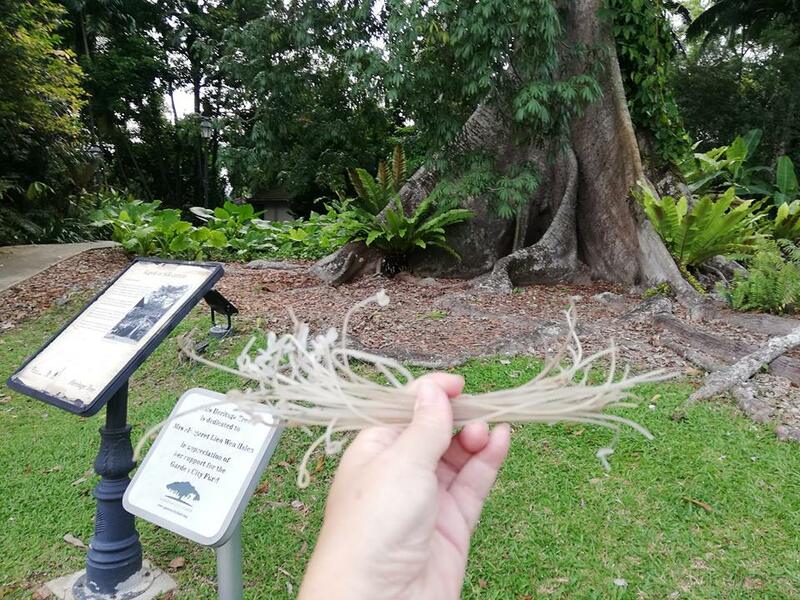 For small grass patches, strings are sometimes found in large numbers next to, instead of among the grass, e.g., in leaf mulch around trees and bushes (Singapore Botanic Gardens, Gardens by the Bay), among decorative pebble displays (Sentosa Beach Station). Strings were often found near drainage gratings, where they will get washed into our waterways. Cleaners may not treat these strings as litter? Strings are often abundant and the only litter found in an otherwise immaculate area. Strings remain uncollected in areas swept through by cleaners in preparation for a VIP visit. Strings can be abundant among leaf mulch which has no other litter. Aug: Sightings shared for 267 strings after initial spontaneous sharing by Ria on facebook. 1-9 Sep: Sightings shared for 255 strings after Shirley and Ria decided to ask for sightings during the school holidays. Shirley suggested mapping the sightings. The rest of Sep: Sightings shared for 803 strings as reports continued to come in after the Sep schoool holidays. October: Sightings shared 1,579 strings. Bill Bremner also shared his sightings from before Aug 2018.